On this date in 1592, the bell of Uglich had its “tongue” cut out, then was sent to Siberian exile — the crowning indignity of the collective punishment visited on that Volga River town for the murder of Tsarevich Dmitri. Although rival interpretations exist,** the conventional understanding of events we shall detail here is that Godunov turned assassin in order to maintain his hold on power and, eventually, achieve the tsardom for himself. Boris Godunov’s 1598 coronation, from the Mussorgsky opera Boris Godunov. Not yet the tsar himself at this point, Godunov’s problem was that he exercised power only through Feodor … and that heirless sovereign had a (much) younger brother, our victim Tsarevich Dmitri, who in the fullness of time might easily come to supplant both Feodor and Godunov. Boris Godunov had hidden this moppet and his mum away in Uglich, where the child had his own court as Russia’s last appanage prince. The English diplomat Gil(l)es Fletcher† never met Dmitry but his 1591 Of the Russe Commonwealth caught the peril of the situation, with a bit of foreshadowing. [The child] is kept in a remote place from the Moscow under the tuition of his mother and her kindred of the house of the Nagois, yet not safe (as I have heard) from attempts of making away by practice of some that aspire to the succession if this emperor die without any issue. The nurse that tasted before him of certain meat (as I have heard) died presently. That he is natural son to Ivan Vasil’evich the Russe people warrant it by the father’s quality that beginneth to appear already in his tender years. He is delighted (they say) to see sheep and other cattle killed and to look on their throats while they are bleeding (which commonly children are afraid to behold), and to beat geese and hens with a staff till he see them lie dead. The court rumors about Dmitry’s danger were onto something. On May 15, 1591, the eight-year-old princeling was found dead. He’d been stabbed in the neck. 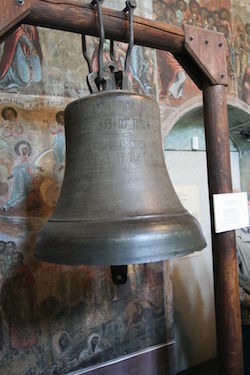 Dmitry’s mother had the local prelates ring the cathedral bell summoning townsfolk to the commons to announce the murder and accuse Boris Godunov’s agents of perpetrating it. Outrage and panic soon whipped people into a mob that rampaged through Uglich, lynching 15 people — including one of Dmitry’s playmates as well as Moscow’s dyak, Mikhail Bityagovsky. 18th century icon of the Tsarevich Dmitry “Uglichsky” (click for larger image) shows his murder (left), and the cathedral bell being sounded to instigate summary justice (right). At the base of the cathedral, Mikhail Bityagovsky tries to batter down the door to silence the alarm. Dangerous to bystanders, this mob was impotent against the Russian state. 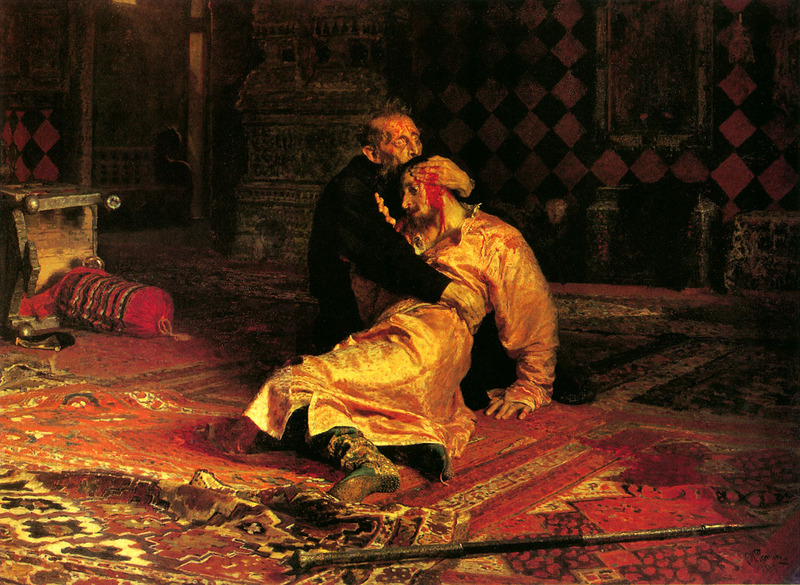 Boris Godunov dispatched a delegation that whitewashed Dmitry’s murder and ruthlessly punished Uglich; some 200 are reported to have been put to death for the disturbances. The bell itself received the crowning punishment on the first of April in 1592, as the literal physical instigator of the riot: hurled from its tower, it was flogged on the public square and mutilated by having its “tongue” (the clapper) torn out. Then it was sent into exile in Tobolsk, where it remained until the 19th century. It hangs today at Uglich’s Church of St. Dmitry on Blood, although — as detailed in the bell’s Russian Wikipedia page — there is some debate about its authenticity. As for “Saint Dmitry”, his story was just beginning and the canonization wasn’t the half of it. When Tsar Feodor died in 1598 and Boris Godunov seized the throne outright, Russia entered her “Time of Troubles” — fifteen terrible years of civil war, invasion, and contested succession that ended with the seating of the Romanov dynasty. The Time of Troubles was characterized by, among other things, several imposters claiming to be this very murdered Prince Dmitry and therefore the rightful tsar. False Dmitrys were so ubiquitous during this interregnum that they have their own pretender regnal numbering, but all were failures in the contest for power: False Dmitri I, False Dmitri II, and False Dmitry III each came to violent and sordid ends. 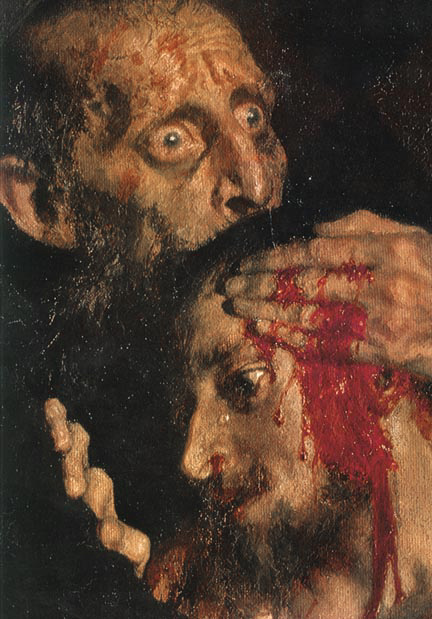 Detail view (click for the full image) of Repin’s rendering of the horrified Ivan the Terrible clutching his mortally wounded son. ** The other principal version (Russian link) is that Dmitry suffered an epileptic fit while playing a game with knives, and accidentally stabbed himself. Many Uglichans gave this story to the official investigation (more Russian) that ensued the prince’s death, but their testimony is hard to depend upon since the Godunov-affiliated authorities conducting the investigation (like Patriarch Job, whom Godunov had made metropolitan of Moscow) preferred that version and presumably made sure that they received it. After Godunov’s death the official story reassigned responsibility to him — although this again was driven by the political imperatives of that moment. Some historians down the years have given credence to the “accident” hypothesis. † That’s Giles Fletcher the elder, who is not to be confused with his son, the poet Giles Fletcher the Younger. ‡ Feodor had only a single daughter, Feodosia, born in 1592 (she died in 1594). As of the time of Dmitry’s murder, Feodor was 33 years old and completely childless. 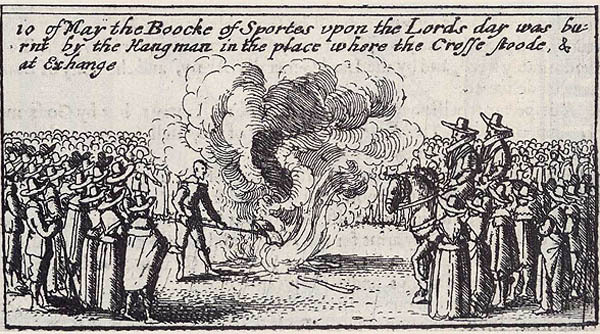 On this date in 1643, all copies of the Book of Sports were publicly burned by the common hangman. The day of the week was the decisive thing here. 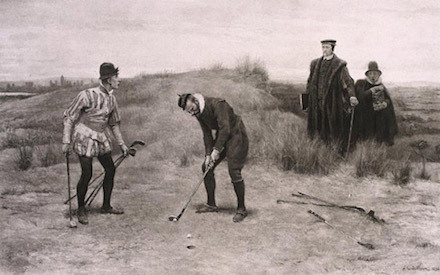 These traditional pastimes had long multiplied upon the numerous feast-days speckling the Catholic medieval calendar, but with the English Reformation this clutch of Papist holidays had been collapsed into just … Sundays. And so sportive Englishmen took their May-poles and Morris-dances to the Sabbath. By the late 16th and early 17th century the burgeoning Puritan movement was burnishing its sourpuss bona fides by — among other things — espousing a strict Sabbatarianism requiring that on their one day of rest from holiday-less labor people be “taken up the whole time in the public and private exercises of His [God’s] worship, and in the duties of necessity and mercy.” No vaulting or any other such harmless recreation for you! I allowe not of such excesse of ryot & superfluitie as is there used. I thinke, it convenient for one Friend to visite another (at sometimes) as oportunitie & occasion shall offer it selfe, but wherfore shuld the whole towne, parish, village and cuntrey, keepe one and the same day, and make such gluttonous feasts as they doo? And therfore, to conclude, they are to no end, except it be to draw a great frequencie of whores, drabbes, theives and verlets together, to maintai[n] […] whordome, bawdrie, gluttony, drunkennesse, thiefte, murther, swearing and all kind of mischief and abhomination. For, these be the ends wherto these feastes, and wakesses doo tende. As one might well suppose from the eventual alliances in the English Civil War, the sports stuff was one of the fault lines between high church and low, and between crown and Parliament. Like any proper inbred royal, King James I loved himself a good hunt, and not only of witches — so he was nonplussed when passing through Lancashire to discover citizen grievances over killjoy blackrobes shutting down their Maypoles. He issued the Book of Sports explicitly in response, “to see that no man do trouble or molest any of our loyal and dutiful people, in or for their lawful recreations.”* This gave leisure-seeking commoners something to throw in the faces of their neighborhood nabobs, and Puritans another abomination to grow incensed about. The Book of Sports remained law of the realm into the reign of James’s Puritan-allergic son Charles I but Puritan muscle grew stronger all the while,** eventually becoming irresistible when Parliament was recalled in 1640 and the high church bishop William Laud was ousted. The outcome in 1643 was the rough impeachment of the sports book and I don’t mean Vegas. It is this day ordered by the Lords and Commons in Parliament, that the Booke concerning the enjoyning and tollerating of Sports upon the Lord’s Day be forthwith burned by the hand of the common Hangman in Cheape-side, and other usuall places: and to this purpose, the Sheriffs of London and Middlesex respectively are hereby required to be assistant to the effectuall execution of this order, and see the said Books burnt accordingly. And all persons who have any of the said Books in their hands, are hereby required forthwith to deliver them to one of the Sheriffes of London, to be burnt according to this Order. Henry Elsynge, Cler. P.D. Com. The Sheriffes of London and Middlesex have assigned Wednesday next the 10th of this instant May, at twelve of the clock, for the putting in execution of the foresaid Ordinance; and therefore doe require all persons that have any of the Bookes therein mentioned, to bring them in by that time, that they may be burned accordingly. Obviously this is not an “execution” even in the metaphorical sense of executions by effigy but part of the wider remit of the hangman, whose duties ran to all sorts of public law enforcement as well as to cajoling society’s untouchables. Still, “purging by fire” of the printed word was extraordinary treatment reserved for blasphemous or seditious books, not uncommonly accompanied by corporal punishment or even death for their authors. It would not far stretch matters to see in the Puritan Parliament’s disdainful lese-majeste against the hand of the past king its imminent regicidal stroke upon the neck of the current one. This was a man with a philosophy on exercise as rigorous as any personal fitness coach. James, who was a prolific scribbler, elsewhere “debarre[d] all rough and violent exercises, as the footeball; meeter for laming, than making able the users thereof.” In four centuries since James so pronounced, England have only ever won the football World Cup once. ** Numerous Puritans fled oppressively pleasurable off-days and took their dour Sabbaths to New England where their descendants could one day propound several of the world’s most obnoxious sporting concerns. 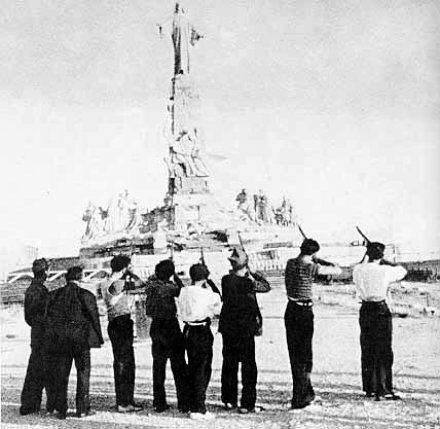 On this date in 1936, anticlerical leftists in the Spanish Civil War allegedly subjected a monumental statue of Christ to a ritual “execution”. Maybe that was inevitable, anyway. the people in this part of Spain must be genuinely without religious feeling — religious feeling, I mean, in the orthodox sense. It is curious that all the time I was in Spain I never once saw a person cross himself; yet you would think such a movement would become instinctive, revolution or no revolution. Obviously the Spanish Church will come back (as the saying goes, night and the Jesuits always return), but there is no doubt that at the outbreak of the revolution it collapsed and was smashed up to an extent that would be unthinkable even for the moribund C. of E. in like circumstances. To the Spanish people, at any rate in Catalonia and Aragon, the Church was a racket pure and simple. And possibly Christian belief was replaced to some extent by Anarchism, whose influence is widely spread and which undoubtedly has a religious tinge. Be that as it may, Republican types suspected photographic fakery. 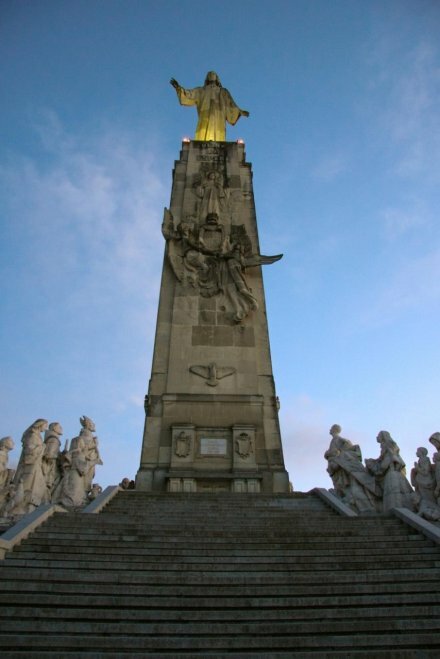 Just like its inspiration is reported to have done, this statue survived its “execution” in fine shapewas resurrected by public subscription, and can still be seen at Cerro de los Angeles outside Madrid. The “executed” statue today. (cc) image from bigchus.